A good cooperative game not only provides players with an engaging experience that requires team work and common goals, it provides a method for facilitating those goals through communication. Sadly, Xbox 360 gamers enjoy a standard voice chat solution through Xbox Live, other systems seem to fall short and require developer intervention or have users taking matters into their own hands. Back in September we looked at Dolby's Axon solution at PAX and came away impressed with what the long time sound company had created. Now as we get closer to the products release, we sat down with Spencer Hooks, Product Marketing Manager in the Games group and Dolby executive Matt Tullis to talk about Axon. Believe it or not Dolby has had a hand in the games industry since the days of the SNES. The game was called King Arthur's World and it was the first game to implement Dolby Surround. Since then we've got to Pro Logic II on the PS2 to actual in game Dolby Digital on the Xbox and current generation systems. In all, there's 3000 games that support Dolby's audio encoding. So why not extend that encoding to voice chat? That's the first piece of this is the Axon technology, an actual API that will be available not only to PC developers, but console developers as well. Featuring things like automatic dialog leveling, noise reduction, echo reduction and more, the Axon API should yield a much better voice chat experience in the game. "There's nothing worse than playing a first person shooter, being caught up in the moment, and having some staticy overly loud dialog crackle through your ear as your teammate talks," said Matt Tullis. Dolby's solution looks to correct this with balanced and clear audio that will allow for positional audio making the experience more immersive. So while we all wait for Axon to be implemented into actual games, we can experience it ourselves with a stand alone chat client for the PC. 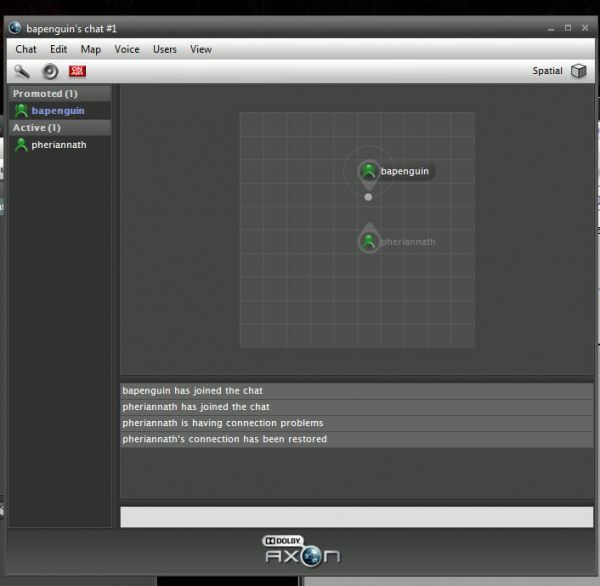 Featuring a lot of the same technology as the API, including a brand new voice codec, the Axon chat client is a unique piece of software. It was recently selected as an Innovations 2010 Design and Engineering Award Honoree in the Electronic Gaming Software product category which will be celebrated at the Consumer Electronics Show in January. The goal for it is to make conversation more like real life, with positional audio and chat capabilities for up to 50 users at once. You'll build a unique friends lists where you can easily create and join conversations, as well as be allowed to build custom persistent chat channels much like IRC. Currently each user can create 3 of these and there is moderation control already implemented. The friends list will show what they are playing if it's Axon capable, and give you an option to join the game. Right now there's only a few games available that support this, most of which are MMOs in China and Korea. The first major worldwide release to support Dolby Axon both in game and in client will be Jumpgate Evolution. Mike and I took the Axon client for a spin to record the latest episode of the Co-Opticast. While there was only two of us, the ability to position your icon relative to the rest of the room is a nice touch, and it's incredibly easy to tell which direction the dialogue is coming from. Setup was a cinch, and the program even auto reconnected our chat when we were disconnected at one point. There did seem to be a bit of "lag" though with the chat, and event though it was minimal - maybe 1/2 a second - it was enough to throw us off our podcasting game a bit. I imagine that in a real game situation, this wouldn't be much of an issue. The Axon client is set to launch in January for an undisclosed price, but Dolby assured us there would always be a free version available. You can currently check out the beta on Dolby's site. Page created in 0.8044 seconds.